The Converter Status Remote Pendant shows the charger/converter operating mode and allows for manual mode selection. The new PD9200 Series RV Converter/Chargers have our patented Charge Wizard built-in to provide you with the most advanced RV battery charging system on the market today. 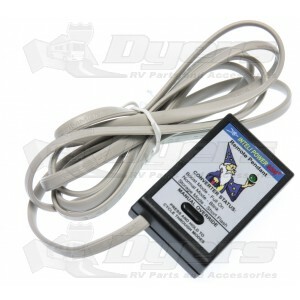 The Charge Wizard is a micro-processor controller that constantly monitors your RV battery voltage and then automatically determines which one of four modes of operation is best suited to recharge or maintain optimum battery condition. The four modes are BOOST, NORMAL, STORAGE and DESULFATION. The Converter Status Remote Pendant will show you which mode the converter is operating in. Boost Mode at 14.4 Volts - Rapidly brings the battery up to 90% of full charge. Normal Mode at 13.6 Volts - Safely completes the charge. Storage Mode at 13.2 Volts - Maintains the charge with minimal gassing or water loss. Desulfation Mode at 14.4 Volts - Every 21 hours for a period of 15 minutes to prevent battery stratification and sulfation. Your Inteli-Power 9200 series converter stays in the selected mode when manual override switch is released. It will return to teh automatic mode, if needed, to prevent damage to the battery. Designed to plug into the standard accessory port on all models of the Inteli-Power 9200 Series Converters. Adhesive backing for easy install.